Yosemite National Park (pronounced "Yo-SEM-it-ee"), is a U.S. national park largely in Mariposa and Tuolumne counties in the state of California. The park covers an area of 1,189 square miles (3,081 km²) and reaches across the western slopes of the Sierra Nevada mountain chain. Yosemite is visited by over 3.5 million visitors each year, with most only seeing the seven square miles of Yosemite Valley. Designated a World Heritage Site in 1984, Yosemite is internationally recognized for its spectacular granite cliffs, waterfalls, clear streams, Giant Sequoia groves, and biological diversity. About 89 percent of the park is designated wilderness area. It was also the first park set aside by the U.S. federal government. Although not the first designated national park, Yosemite was a focal point in the development of the national park idea, largely owing to the work of people such as John Muir. Yosemite is one of the largest and least fragmented habitat blocks in the Sierra Nevada, supporting a diversity of plants and animals. 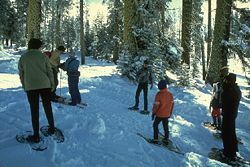 The park has an elevation range from 2,000 to 13,114 feet (600 to 4000 m) and contains five major vegetation zones: chaparral/oak woodland, lower montane, upper montane, subalpine and alpine. Of California's 7,000 plant species, about 50% occur in the Sierra Nevada and more than 20% within Yosemite. Yosemite National Park is located in the central Sierra Nevada of California. Yosemite is surrounded by wilderness areas: the Ansel Adams Wilderness to the southeast, the Hoover Wilderness to the northeast, and the Emigrant Wilderness to the north. Almost all of the landforms in the Yosemite area are cut from the granitic rock of the Sierra Nevada Batholith (a large mass of intrusive igneous rock that formed deep below the surface). About five percent of the park, mostly in its eastern margin near Mount Dana, are from metamorphosed volcanic and sedimentary rocks. These rocks are called "roof pendants" because they were once the roof of the underlying granitic rock. Erosion acting upon different types of uplift-created joint and fracture systems is responsible for creating the valleys, canyons, domes, and other features we see today (these joints and fracture systems do not move, and are therefore not geological faults). Spacing between joints and fracture systems is largely due to the amount of silica in the granite and granodiorite rocks; more silica tends to create larger spaces between joints and fractures and thus a more resistant rock. Pillars and columns, such as Washington Column and Lost Arrow, are created by cross joints. Erosion acting on master joints is responsible for creating valleys and later canyons. The single most erosive force over the last few million years has been from large alpine glaciers, which have turned the previously V-shaped river-cut valleys into U-shaped glacial-cut canyons (such as Yosemite Valley and Hetch Hetchy Valley). Exfoliation (caused by the tendency of crystals in plutonic rocks to expand at the surface) acting on granitic rock with widely spaced joints is responsible for creating domes such as Half Dome and North Dome and inset arches like Royal Arches. Yosemite Valley represents only one percent of the park area, but this is where most visitors arrive and stay. El Capitan, a prominent granite cliff that looms over the valley, is one of the most popular world destinations for rock climbers because of its diverse range of difficulties and numerous established climbing routes in addition to its year-round accessibility. Impressive granite domes such as Sentinel Dome and Half Dome rise 3,000 feet and 4,800 feet (900 and 1450 m), respectively, above the valley floor. The high country of Yosemite contains beautiful areas, such as Tuolumne Meadows, Dana Meadows, the Clark Range, the Cathedral Range, and the Kuna Crest. The Sierra crest and the Pacific Crest Trail run through Yosemite, with peaks of red metamorphic rock, such as Mount Dana and Mount Gibbs, and granite peaks, such as Mount Conness. Mount Lyell is the highest point in the park. Bridalveil Fall springs from a U-shaped hanging valley that was created by a tributary glacier. Yosemite is famous for its high concentration of waterfalls in a small area. Numerous sheer drops, glacial steps and hanging valleys in the park provide many places for waterfalls to exist, especially during April, May, and June, the snowmelt season. Located in Yosemite Valley, the 2425-foot-high (782 m) Yosemite Falls is the highest in North America and the third highest in the world. Also in the valley is the much lower volume Ribbon Falls, which has the highest single vertical drop, 1612 feet (492 m). Perhaps the most prominent of the Yosemite waterfalls is Bridalveil Fall, which is the waterfall seen from the Tunnel View viewpoint at the east end of the Wawona Tunnel. Wapama Falls in Hetch Hetchy Valley is another notable waterfall. Hundreds of ephemeral waterfalls also exist in the park. Temperature decreases with increasing elevation. Temperature extremes are moderated by the fact that Yosemite is only about 100 miles (160 km) from the Pacific Ocean. An anticyclone sits off the coast of California in the summer, sending cool air masses toward the Sierra Nevada that result in clean dry air in the Yosemite area. 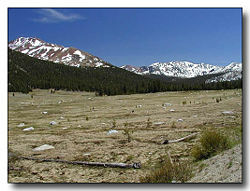 Mean daily temperatures range from 25 to 53 °F (-3.9 to 11.5 °C) at Tuolumne Meadows at 8,600 feet (2,600 m). At South Entrance near Wawona (elevation 6192 feet; 1887 m), mean daily temperature ranges from 36 to 67 °F (2.2 to 19.4 °C). At the lower elevations below 5,000 feet (1525 m), temperatures are hotter; the mean daily high temperature at Yosemite Valley (elevation 3,966 feet; 1209 m) varies from 46 to 90 °F (7.8 to 32.2 °C). At elevations above 8,000 feet (2440 m), the hot, dry summer temperatures are moderated by frequent summer thunderstorms, along with snow that can persist into July. The combination of dry vegetation, low relative humidity, and thunderstorms results in frequent lightning-caused fires as well. The California Gold Rush in the mid-nineteenth century dramatically increased white travel in the area. United States Army Major James Savage led the Mariposa Battalion into Yosemite Valley in 1851 while in pursuit of around 200 Ahwaneechees led by Chief Tenaya as part of the Mariposa Wars. Accounts from this battalion were the first confirmed cases of Caucasians entering the valley. Attached to Savage's unit was Dr. Lafayette Bunnell, the company physician, who later wrote about his awestruck impressions of the valley in The Discovery of the Yosemite. Bunnell is credited with naming the valley from his interviews with Chief Tenaya. Bunnell wrote that Chief Tenaya was the founder of the Pai-Ute Colony of Ah-wah-nee. The Miwoks (and most white settlers) considered the Ahwahneechee to be especially violent due to their frequent territorial disputes, and the Miwok word "yohhe'meti" literally means "they are killers." Correspondence and articles written by members of the battalion helped to popularize the valley and surrounding area. 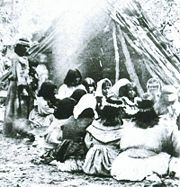 Tenaya and the rest of the Ahwahneechee were eventually captured and their village burned. They were removed to an Indian Reservation near Fresno, California. Some were later allowed to return to the valley, but got in trouble after attacking a group of eight gold miners in 1852. The band fled and took refuge with the nearby Mono tribe; but after reportedly stealing horses from their hosts, the Ahwahneechees were tracked down and killed by the Monos. A reconstructed "Indian Village of Ahwahnee" is now located behind the Yosemite Museum, which is next to the Yosemite Valley Visitor Center. Entrepreneur James Mason Hutchings, artist Thomas Ayres, and two others ventured into the Yosemite area in 1855, becoming the valley's first tourists. Hutchings wrote articles and books about this journey and later excursions in the area and Ayres' sketches became the first accurate drawings of many prominent features. Photographer Charles Leander Weed took the first photographs of the Valley's features in 1859. Later photographers included Ansel Adams. Wawona, California was an Indian encampment in what is now the southwestern area of the park. 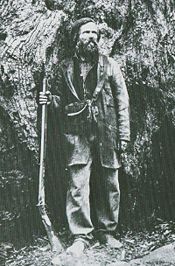 Settler Galen Clark discovered the Mariposa Grove of Giant Sequoia in Wawona in 1857. Simple lodgings were built, as were roads to the area. In 1879, the Wawona Hotel was built to serve tourists visiting the Grove. As tourism increased, so did the number of trails and hotels. Concerned by the effects of commercial interests, several prominent people, including Galen Clark and Senator John Conness advocated for protection of the area. A park bill passed both houses of the U.S. Congress and was signed by President Abraham Lincoln on June 30, 1864, creating the Yosemite Grant. Yosemite Valley and the Mariposa Grove were ceded to California as a state park and a board of commissioners was proclaimed two years later. The Yosemite Grant counts as a landmark bill, as it predates the establishment of Yellowstone National Park, officially the first "national park." Galen Clark was appointed by the commission as the grant's first guardian but neither Clark nor the commissioners had the authority to evict homesteaders (which included Hutchings). The issue was not settled until 1875 when the land holdings were invalidated. Clark and the reigning commissioners were ousted in 1880 and Hutchings became the new park guardian. Access to the park by tourists improved in the early years of the park and conditions in the Valley were made more hospitable. Tourism started to significantly increase after the First Transcontinental Railroad was completed in 1869, but the long horseback ride needed to reach the area was a deterrent. Three stagecoach roads were built in the mid-1870s to provide better access to the growing number of visitors to the Valley. Overgrazing of meadows (especially by sheep), logging of Giant Sequoia, and other damage caused Muir to become an advocate for further protection. Muir convinced prominent guests of the importance of putting the area under federal protection. One such guest was Robert Underwood Johnson, editor of Century Magazine. Through Johnson, he was able to help pass an act of Congress that created Yosemite National Park on October 1, 1890. The State of California, however, retained control of the Valley and Grove. Muir also helped persuade local officials to virtually eliminate grazing from the Yosemite High Country. The newly created national park came under the jurisdiction of the United States Army's Fourth Cavalry Regiment on May 19, 1891, which set up camp in Wawona. By the late 1890s, sheep grazing was no longer a problem, and the Army made many other improvements. The Cavalry could not intervene to help the worsening condition of the Valley or Grove. Muir and his Sierra Club continued to lobby the government and influential people for the creation of a unified Yosemite National Park. 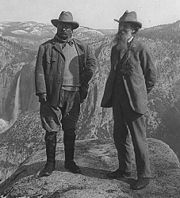 In May 1903, President Theodore Roosevelt camped with John Muir near Glacier Point for three days. On that trip, Muir convinced Roosevelt to take control of the Valley and the Grove away from California and give it to the federal government. In 1906, Roosevelt signed a bill that did precisely that. The National Park Service was formed in 1916 and Yosemite was transferred to that agency's jurisdiction. Tuolumne Meadows Lodge, Tioga Pass Road, and campgrounds at Tenaya and Merced lakes were also completed in 1916. Automobiles began to enter the park in ever-increasing numbers following the construction of all-weather highways to the park. The Yosemite Museum was founded in the early 1920s through the efforts of Ansel Franklin Hall. To the north of Yosemite Valley but within the park is Hetch Hetchy Valley, which was slated for flooding to create a reservoir and hydroelectric power plant to benefit far-away San Francisco. A nationally polarized fight ensued, pitting preservationists like Muir and his Sierra Club against conservationists like Gifford Pinchot. The U.S. Congress eventually authorized the O'Shaughnessy Dam in 1913 through passage of the Raker Act. Since then, preservationists have convinced Congress to designate 677,600 acres (2,742 km²), or about 89% of the park, as the Yosemite Wilderness—a highly protected wilderness area. The Park Service has also been moving away from allowing touristy inducements to visit the park, such as the famous Yosemite Firefall (in which red-hot embers were pushed off a cliff near Glacier Point at night). Increasing traffic congestion in Yosemite Valley during the summer months has also been an issue of concern. Proposals to exclude all automobiles in the summer that are not registered at a hotel or campground within the valley have been investigated. This would force all summer day-use visitors in the valley to use the free shuttle system, bike, or walk in the 7-mile-long (11 km) valley. The exposed geology of the Yosemite area includes primarily granitic rocks with some older metamorphic rocks. The first rocks were laid down in Precambrian times, when the area around Yosemite National Park was on the edge of a very young North American continent. This area was astride a passive continental margin during the Precambrian and early Paleozoic eras. The sediment that formed the area first settled in the waters of a shallow sea, and compressive forces from a subduction zone in the mid-Paleozoic fused the seabed rocks and sediments, appending them to the continent. 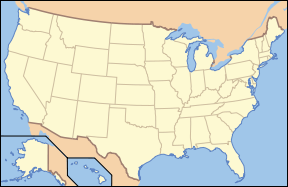 Heat generated from the Farallon Plate subducting below the North American Plate led to the creation of an island arc of volcanoes on the west coast of proto-North America between the late Devonian and Permian periods (not unlike Japan) that were also thrust into the area of the park. In time, the igneous and sedimentary rocks of the area were later heavily metamorphosed. The first phase of regional plutonism began 210 million years ago in the late Triassic and continued throughout the Jurassic to about 150 million years before present. Around the same time, the Nevadan orogeny built the Nevadan mountain range (also called the Ancestral Sierra Nevada) to a height of 15,000 feet (4500 m). This was directly part of the creation of the Sierra Nevada Batholith, and the resulting rocks were mostly granitic in composition and emplaced about 6 miles (10 km) below the surface. The second major pluton emplacement phase lasted from about 120 million to 80 million years ago during the Cretaceous. This was part of the Sevier orogeny. Starting 20 million years ago (in the Cenozoic) and lasting until 5 million years ago a now-extinct extension of Cascade Range volcanoes erupted, bringing large amounts of igneous material in the area. 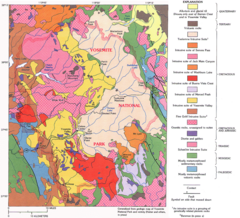 These igneous deposits blanketed the region north of the Yosemite region. Volcanic activity persisted past 5 million years before present east of the current park borders in the Mono Lake and Long Valley Caldera areas. Starting 10 million years ago, vertical movement along the Sierra fault began to uplift the Sierra Nevada. Subsequent tilting of the Sierra block and the resulting accelerated uplift of the Sierra Nevada increased the gradient of western-flowing streams. The streams consequently ran faster and thus cut their valleys more quickly. Additional uplift occurred when major faults developed to the east, especially the creation of Owens Valley from Basin and Range-associated extensional forces. Uplift of the Sierra accelerated again about two million years ago during the Pleistocene. A series of glaciations further modified the region beginning about 2 to 3 million years ago and ending sometime around 10,000 bp. At least 4 major glaciations have occurred in the Sierra Nevada; locally called the Sherwin (also called the pre-Tahoe), Tahoe, Tenaya, and Tioga. The Sherwin glaciers were the largest, filling Yosemite and other valleys, while later stages produced much smaller glaciers. A Sherwin-age glacier was almost surely responsible for the major excavation and shaping of Yosemite Valley and other canyons in the area. Glacial systems reached depths of up to 4000 feet (1200 m) and left their marks in the Yosemite area. The longest glacier in the Yosemite area ran down the Grand Canyon of the Tuolumne River for 60 miles (95 km), passing well beyond Hetch Hetchy Valley. Merced Glacier flowed out of Yosemite Valley and into the Merced River Gorge. Lee Vining Glacier carved Lee Vining Canyon and emptied into Lake Russel (the much-enlarged ice age version of Mono Lake). Only the highest peaks, such as Mount Dana and Mount Conness, were not covered by glaciers. Retreating glaciers often left recessional moraines that impounded lakes such as Lake Yosemite (a shallow lake that periodically covered much of the floor of Yosemite Valley). An American Black Bear with a conspicuous ear tag browsing on its natural foods in Yosemite Valley. Going higher in elevation, the coniferous forests become purer stands of Red Fir, Western White Pine, Jeffrey Pine, Lodgepole Pine, and the occasional Foxtail pine. Fewer wildlife species tend to be found in these habitats, due to their higher elevation, and lower complexity. Species likely to be found include Golden-mantled Ground Squirrel, Chickaree, Marten, Steller's Jay, Hermit Thrush, and Northern Goshawk. Reptiles are not common, but include Rubber Boa, western fence lizard, and Northern Alligator Lizard. Increasing ozone pollution is causing tissue damage to the massive Giant Sequoia trees in the park. This makes them more vulnerable to insect infestation and disease. Since the cones of these trees require fire-touched soil to germinate, historic fire–suppression has reduced these trees' ability to reproduce. The current policy of setting prescribed fires will hopefully help the germination issue. 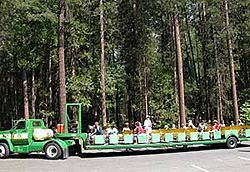 A tram in the Mariposa Grove of Giant Sequoia. Looking south from Tioga Pass at Dana Meadows. Yosemite Valley is open year-round, but much of the rest of the park is closed due to snow in late autumn and does not re-open until mid to late spring. Open-air tours around Yosemite Valley and the Mariposa Grove of Giant Sequoias are available. Many people enjoy short walks and longer hikes to waterfalls in Yosemite Valley, or walks amongst Giant Sequoias in the Mariposa, Tuolumne, or Merced Groves. Others like to drive or take a tour bus to Glacier Point in the summer and fall to see a spectacular view of Yosemite Valley and the high country, or drive along the scenic Tioga Road to Tuolumne Meadows, then go for a walk or hike. 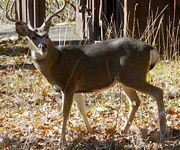 Almost all of the park, however, is highly-protected roadless wilderness that does not allow motorized vehicles and requires permits for overnight stays. Yosemite boast two National Historic Landmarks: the LeConte Memorial Lodge (Yosemite's first public visitor center); and the Ahwahnee Hotel. Driving destinations: While some locations in Yosemite require hiking, other locations can be observed via automobile transportation. Driving locations also allow guests to observe the night sky in locations other than their campsite or lodge. All of the roads in Yosemite are scenic, but the most famous is the Tioga Road, typically open from late May or early June through November. Bicycles are allowed on Yosemite's roads, though only 12 miles of paved trails exist for biking, excluding mountain biking, which is not allowed. History of "Yosemite National Park"
This page was last modified on 28 July 2013, at 16:42.